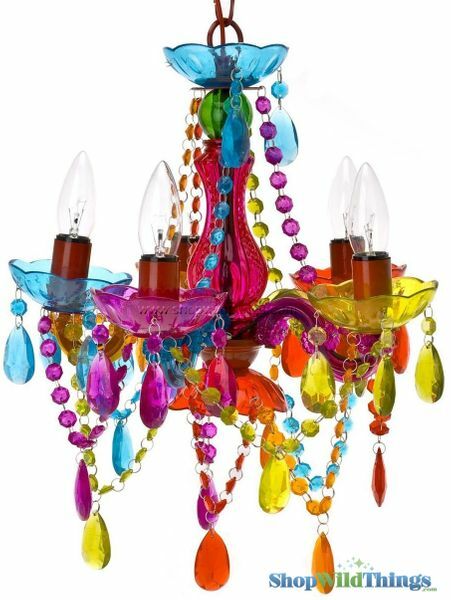 Our Small Multi-color Gypsy Rainbow Chandeliers will add class and intrigue to your home, event, or retail environment. Dripping with beads, this 5 arm chandelier is constructed beautifully using acrylic, glass, and resin. The chandelier body is 13" in diameter and 15" tall from the top of the body to the bottom hanging pendant. The hanging cord and chain, from the top of the body to the ceiling cap, is 24" long for a total hanging length of 39". The ceiling cap is 5.25" in diameter by 2.5" deep. Use five E12 bulbs, max 25 watts each (bulbs not included). These lamps are hard-wired and require installation by a qualified electrician. It can also be converted to plug-in style by an electrician. This chandelier weighs just over 4 lbs. It's more beautiful in person. We have it in our daughter's bedroom. Easy to install. I am very happy with this item except that I do not know where or how to find the light bulbs for it. Merchant Response:Thank you for taking the time to tell us your thoughts on your purchase. You should be able to find the E12 bulbs, max 25 watt anywhere light bulbs are sold. 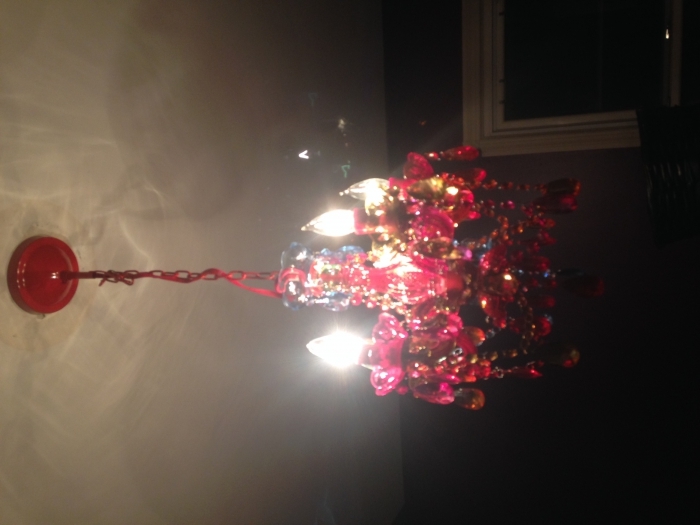 They are used in many types of chandeliers and lamps. If you need help, please give us a call, we will be happy to assist you in finding this in your area. I am very pleased with this small chandelier. The colors are clear and gorgeous when lit by the bulbs. The only difficulty I had was in figuring out what kind of bulbs to use. I finally found the specs on the outside of the box. It would have been handy if that information was in the little information leaflet included in the shipment. But all is well and my grandchildren love the chandelier! ProsSmall size. Option for ceiling mount or chain mount. I love it. Great for tiny homes n bdrms. Bought 2 of these! Love them!! They are adorable!